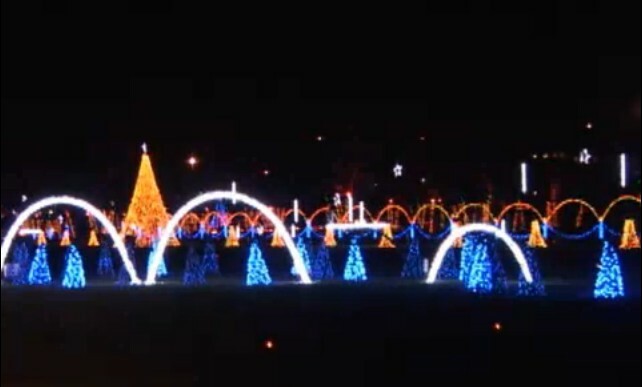 HomeHome /	/ Blog / Smoky Mountains / Shadrack’s Christmas Wonderland: A Drive-Through of Music & Lights Dancing All Around! We know there are literally many millions of winter lights in the Gatlinburg & Pigeon Forge area, but how about a set of synchronized Christmas lights you can drive through? That’s right, it’s perfect family fun when everyone of all ages can pile in the car and motor over to Sevierville to enjoy the legendary light show of Shadrack’s Christmas Wonderland. Drive into Shadrack and follow the course through a maze of constructed Christmas ornamentation and fantasy lit with hundreds of thousands of LED lights. Tune the radio to the Shadrack sound and marvel at the split-second synchronizations, as the scenery around you dances to the Christmas music! Technically, Shadrack’s Christmas Wonderland is top of the league in programmed sound and lighting (audio-visual buffs will drool at knowing more than 1,600 signal channels create this Christmas magic). Since its inception in Bristol, Tennessee, through today with four locations across the country, Shadrack has received numerous awards and national acclaim for its creative inventions and its button-down display choreography. For 2013 the Sevierville operation boasts an expanded driving route, with some “all new, never-before-seen GIANT displays” to marvel at. The theme this year is Santa’s Beach Party, so expect some new creations not typically associated with the cold winter snows. As always, Shadrack offers reasons to get out the car, especially for the kids. How about a camel ride? Or a pony? Let the kids work off those car cramps with the inflatable bouncy castle. Shadrack also offers a petting zoo, Santa train ride, Christmas trees and holiday treats and refreshments. Admission is free to Santa’s Village, with Santa himself on hand, and photo packages available. Shadrack’s Christmas Wonderland is open EVERY evening including Christmas, from dusk until 10 pm (later on weekends), but only until January 5th, its last day. Make your plans to catch it before it’s gone! For more information and directions check the Shadrack Web Site. I've worked for Gatlinburg Falls and now Venture Resorts since their inception in 2004. I was born in New London Connecticut, but was raised in Florida. I attended the University of Florida and earned a BS in Electrical Engineering. I then made the obvious transition from that world to Cabin Rentals. I enjoy everything about my job from people management to interacting with guest.